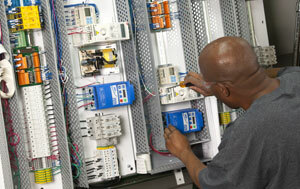 Panel building, machine wiring, and controls programming is yet another service we keep in-house and under full control. With us, you will never have to hear an excuse about a sub-contractor being late or missing a detail. Our controls programmers are cross-trained on several robot languages, PLC programs, and vision systems such as Allen Bradley, Cognex, Epson, Fanuc, National Instruments, and Siemens. Please see our Partners Page for a list of automation components we support. We specialize in integrating sophisticated equipment for small component assembly and product testing. We are one of the oldest robot and vision system integrators in the country and we have certified LabVIEW developers on staff. The more complex and high tech your product process is, the more value we will provide.